There are common midlife events that account for the special narcissistic vulnerabilities of this period of life, and Eda Goldstein ably reviews these events and the theoretical perspectives commonly brought to bear on them. In When the Bubble Bursts, however, Goldstein's special concern is those individuals who come to midlife with heightened narcissistic vulnerabilities that make the navigation of this stage of life more difficult still. In understanding the latter such patients and devising a treatment approach appropriate to their "self" issues, Goldstein adopts a broadly self-psychological frame of reference. It is a matter, she finds again and again, of understanding how current stressors frustrate healthy self needs and trigger narcissistic vulnerabilities. Self-psychologically informed treatment, which, in Goldstein's pragmatic purview, embraces modalities that are, to varying degrees, supportive, psychodynamic, and psychoanalytic, reworks and strengthens self structures in helping patients find new ways of affirming their sense of self. Her substantive case studies, which accompany the reader through all the chapters in her study, draw on personal and supervisory experiences to illustrate crucial foci of the treatment process with a range of midlife patients in psychotherapy. Eda Goldstein presents a study that comprises an admirable blend of theoretical astuteness, clinical wisdom, and personal honesty. Her clinical study of midlife narcissistic pathology is bracketed by her balanced discussion of theoretical perspectives on adult development and her concluding consideration of the countertransference issues elicited by midlife patients in midlife therapists. When the Bubble Bursts is an edifying contribution to the literatures of psychodynamic psychotherapy, self psychology, and adult development. “Although ‘midlife’ has gradually become fertile terrain for developmental theorists and a small army of writers in the popular domain, far less attention has been paid to precisely how issues affecting individuals in midlife are explored and resolved in the clinical setting. In this work, deftly guided excursions into the realm of midlife theory are complemented by expertly crafted, detailed case illustrations. Eda Goldstein's skillful rendering of clinical process is enhanced by her decision to follow several cases over the course of treatment. Although avowedly self psychological in her orientation, Goldstein espouses an approach that is creative and integrative, matched only by her clinical acumen and the candor she displays in discussing contributions from the side of the therapist." "The author speaks with an experienced voice in working with clinical issues that arise in psychotherapy with patients at midlife. The material is interwoven with focused clinical vignettes addressing specific issues under discussion. The treatment throughout is balanced and constructive and should prove a valuable contribution to the growing literature on therapy in later phases of the life cycle." "Goldstein's book is a very readable welcome addition to the psychodynamic literature on working with individuals who present with issues concerning a mid-life crisis. This volume is highly recommended in the way it clearly shows the efficacy of an exploratory, uncovering psychotherapy that relies upon the usage of both empathy and interpretation to produce personality change." "This book caused me to really look at midlife and later life challenges in a very personal way, and led me to experience many moments of personal reflection and many moments of insight about myself and those whom I advise. In addition, there are beautifully written summaries of theories and very insightful observations of midlife issues for people who are having difficulty, and there are detailed examples of how to offer therapeutic help. 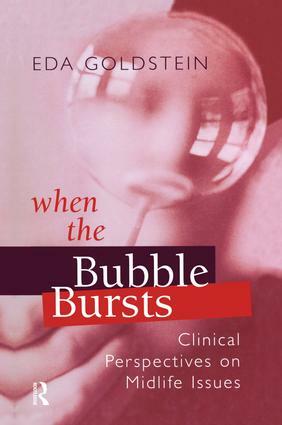 When the Bubble Bursts was written as an aid to clinicians interested in the psychotherapy of persons in midlife; however, it will be of interest to job coaches, counselors to organizations with middle-aged and older workers, and educators and researchers focusing on midlife issues. This book is very well written in clear language with excellent examples. It could be read by advanced undergraduates or graduate students yet is very strong for experienced professionals." Issues in Midlife and the Psychotherapeutic Process: An Overview. Theories of Midlife. Midlife Events: The Impact of Loss and Change. Healthy and Pathological Narcissism: Theoretical and Clinical Perspectives. The Nature of Assessment in Psychotherapy. The Focus and Process of Psychotherapy: Part I. The Focus and Process of Psychotherapy: Part II. Countertransference, Self-Disclosure, and the Rewards of Treatment. Epilogue. Eda Goldstein, D.S.W., is Professor and Director of the Post Master's Certificate Program in Clinical Practice of the Ehrenkrantz School of Social Work of New York University. Among her many publications is Lesbian Identity and Contemporary Psychotherapy (Analytic Press, 2003), which she co-authored with Lois Horowitz.